The Tech baseball team seems to have found their groove, winning their last five games including a three game series sweep of ACC foe Duke and midweek wins over in-state opponents Georgia Southern and Savannah State University. The Jackets look to continue the streak this weekend, but it will not be easy when the second ranked Florida State Seminoles come to Atlanta. Florida State currently sits atop the Atlantic Division standings with a record of 26-6 (13-2 ACC). The Jackets are currently tied at third along with Pittsburgh in the Coastal Division standings at 20-13 (8-7 ACC). A series win for the Jackets over the Seminoles would obviously be important in the standings, but Tech sophomore left fielder Matt Gonzales believes it will also be important for the team’s morale. “I think it would be huge. I think it would give us more momentum as we get deeper into the ACC season and it would just give us some more confidence,” Gonzalez said. 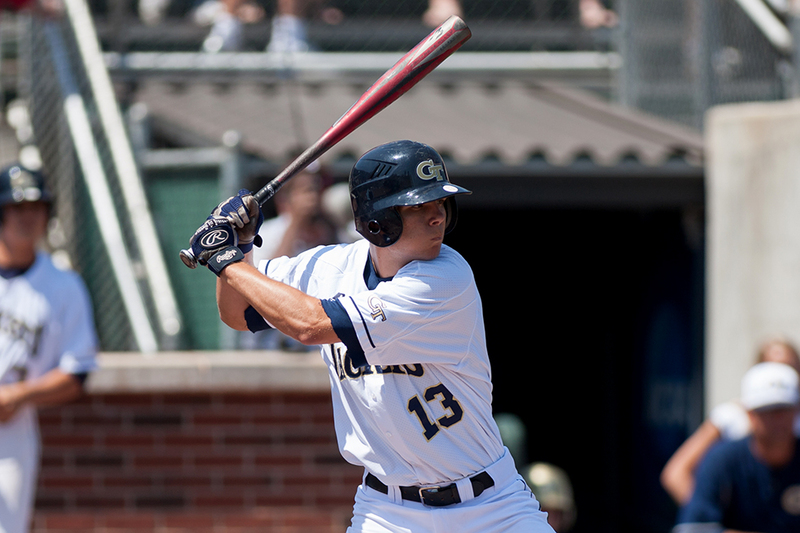 Gonzalez is currently hitting .326 for the Jackets and is second on the team with 23 RBIs. Florida State also comes into the series playing some of their best ball of the season. The Seminoles have won seven of their last eight games and have won their last eight conference games with series sweeps over Boston College and Notre Dame. The Seminoles are led by Preseason All-American sophomore outfielder D.J. Stewart who is hitting a team leading .386 to go along with a team high six home runs on the season. On the mound, Florida State is led by junior Luke Weaver. Weaver is 5-2 in eight starts this season with a 2.83 ERA. Brandon Leibrandt, an Atlanta native, is another important piece of the Seminoles’ rotation, but missed his last two starts due to a knee contusion and may be out again this weekend against Tech as he awaits the results of an MRI. Florida State also has Jameis Winston coming out of their bullpen. Winston, who won the Heisman Trophy after leading Florida State’s football team to a National Championship, has made 11 appearances and has an ERA of 1.76. There is a possibility that Winston will miss the series with Florida State’s spring football game also taking place this weekend, but he may play for the Friday game. Gonzalez admitted that getting to playing against the Heisman Trophy winner last season in Tallahassee was pretty cool and said it will be a neat experience again this year if Winston is able to make the trip. Though Florida State and their lethal offense present quite the challenge for the Jackets, it should be noted that Tech has found success when playing ranked teams this season. The first series win over a ranked opponent for Tech this season came against 22 ranked Miami. Tech lost on Friday before taking the last two games on Saturday and Sunday. Just a week later Tech took a series over 13 ranked North Carolina in similar fashion after losing the opener in extra innings before winning the last two games of the series. Even with Tech’s record of 4-2 against ranked opponents this season, Tech’s inconsistency has made it difficult for them to climb to the top of the ACC standings. After winning the series against North Carolina, the Jackets came back to Atlanta and fell to Mercer 4-1 in a midweek contest before traveling to Pittsburgh and being swept by the Panthers. The Jackets then came and picked up a midweek win over Georgia State followed by a series sweep over Duke, and they now find themselves on a six game winning streak after having lost four in a row. Tech is certainly a young team, starting at least three freshmen in the field every game this season, and some of the inconsistency could certainly be due to the youth. Consistency is something the Jackets will need to find as their conference schedule does not get much easier after the Florida State series. In two weeks, Tech hosts 25 ranked North Carolina State and then travels to Charlottesville, Va. to face the number one ranked Cavaliers in Tech’s final ACC series of the season. The Jackets will also face in-state rival UGA two more times this season.